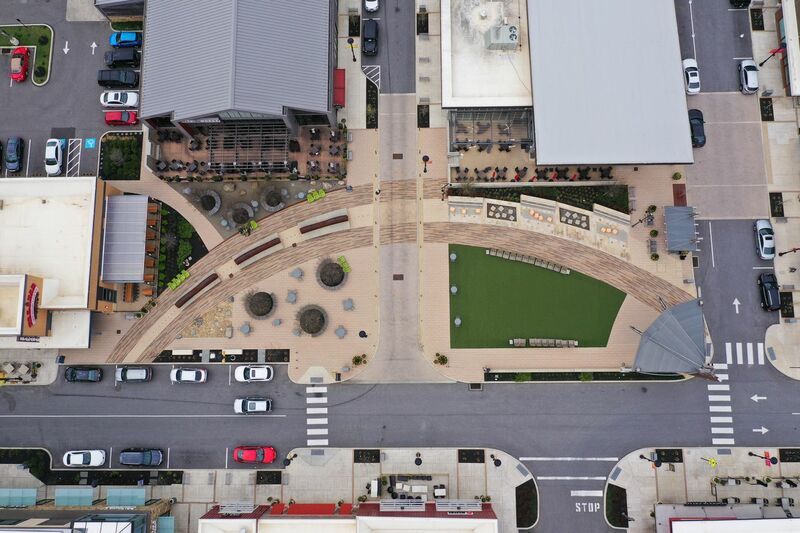 An aerial view of Main Street at King of Prussia Town Center, a downtown-within-a-suburb development of shops, sidewalks and apartments fashioned out of a former course wedged between the Schuylkill Expressway and titanic King of Prussia Mall. This was supposed to be a piece-of-cake suburban parking job: Exit one of the two interstates that dump bazillions of drivers each day into the bowels of King of Prussia, drive to the new Latin rum bar in a newly built shopping district called “Town Center,” and hang with the girls for a weekend bridal shower. Instead, it was like an episode of Survivor. The Honda pulled into a giant parking lot off Gulph Road and past a Wegmans — that famously gigantic supermarket that resembles a feudal castle. The car then entered a picturesque enclave of new construction I had seen only from afar prior to this Saturday afternoon a month ago: curbs, sidewalks, low-slung storefronts, parallel parking, and a turf-green plaza with lounge chairs, outdoor seating, and walkable restaurants. Think the Piazza in Northern Liberties, but on what used to be virginal soil instead of a decrepit old brewery in Philly. This place looks and feels like a dense corner of downtown Philly — what planners like to call “retrofitting” the suburbs for city living. There’s nothing like it anywhere else in the region. It’s next to the King of Prussia Mall, one of the largest in North America. King of Prussia is the Land Of Cars. Cars bring so many people there to shop that merchants desperately look to locate in our region’s most insane shopping mecca. They do cars here in KoP, and they do cars well because it’s KoP. You have to. But Town Center? Well, someone missed the memo that a whole lot of people around it would need cars to get there — and spots to stick those cars in. Behind the wheel of my car at Town Center, I felt like a shark in an ocean of anxiety. I circled and lurked and jockeyed with other drivers — in my case for 20 minutes — to find a single open space. It was like whack-a-mole, but with no mallet, and that’s no fun. I found joy only on the roof of the single public garage. The glass of rum punch afterward inside Paladar Latin Kitchen and Rum Bar? Let’s just say I found joy in that, too, after all that. On social media, in interviews there, and with others I spoke to, I discovered that there is, indeed, a parking problem at this manufactured kingdom of consumption that was built for feet in a car community. The visionaries behind this development built it to be dense and walkable. City living is all the rage these days. And density is profitable, which is music to developers’ ears. It’s a win-win. But you can’t just force suburbia to not be suburbia. Or plan without realizing your market’s true size. Imagine if someone tried to raze six blocks of Center City to build King of Prussia Mall as it currently exists in the 'burbs. They tried that once. It was called The Gallery. It failed. Shruti Chandrasekar, 20, right, talks to boyfriend Stephen Kunanathan, 22, while lounging on the "Main Street" green at King of Prussia Town Center on Thursday, April 11, 2019. “This is the Number One item that we’re working on," Joe Mancuso, managing director of CBRE Global Investors of New York, told me Friday on the phone. There are 1,164 parking spaces, he said. That’s a lot — but not enough for the demand. New high-rise apartment complexes form the perimeter of Town Center at King of Prussia. A parking shortage is a major concern at the popular city-within-a-suburb that has been built as a one-of-a-kind community in suburban Philly. Town Center rose in recent years on a golf course after a years-long battle in court defended by its developer, Realen Corp. of Berwyn. Today, with construction still underway, it is an impressive community of retail, high-rise surrounding apartments, houses, medical office space, and still more to come. They call it “Village at Valley Forge.” CBRE bought the Town Center retail portion in 2017. Mancuso hit on the right word: Problem. Oh — and customers. They’re always right. And in this neck of the woods, if you want their cash, you must respect their cars.